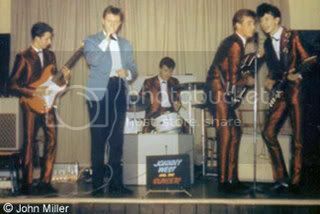 Johnny West and The Sunsets were one of Birmingham’s many rock ‘n’ roll groups who performed at social clubs and pubs during the late 1950s and early 1960s. In that pre-Beatles era, bands almost always featured a lead singer or “front man” who would usually go under a stage name or alias. Early in 1962 Johnny West and The Sunsets formed as a group. Their main choice of music was chart-based and meant keeping up with the Top 20. This included a mixture of American rock ‘n’ roll as well as hits by the main groups of the day from Britain. The American artiste’s featured strongly and were very popular. Our group played numbers by Jerry Lee Lewis, Chuck Berry, Roy Orbison, Eddie Cochran, Buddy Holly and of course the great Elvis. Our lead guitarist Bob Fellows was a big Shadows fan (complete with a much-coveted Fender Stratocaster guitar and Vox amp) so our sets included a lot of their numbers. Later on, the songs that really went down well were by The Beatles who had exploded onto the music world. Also in demand were numbers by The Searchers, The Dave Clarke Five, and Cliff Richard. Our first booking was a social club in Tamworth-Staffs which is now a Witherspoon Pub. I remember having stage fright as I counted in our first number and literally froze for about 30 seconds!! Fortunately, all went well in the end. Please note the red “sparkle suits” looked great under stage lights but the trouble was the material could split very easily. Everyone in the group split their trousers at some time or other! 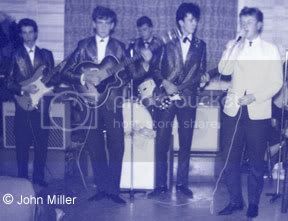 Johnny West and The Sunsets played mainly at Social Clubs around West Bromwich, Wednesbury, Dudley, and Bilston Town Hall at one stage. There was a thriving pub scene in the sixties so Saturdays were almost guaranteed pay nights. Other venues included The Tyburn Inn, Hen and Chickens (Langley), The Queens Head in Erdington, The Swan (Yardley), and The Golden Cross (Short Heath). Eventually, different musical preferences started to affect the band and it resulted in members leaving and going on to join other bands. I joined The Rocking Renowns which evolved into CATCH 22. Once again as a young man I really enjoyed that period in my life. I have no idea what happened to the lads in Johnny West and The Sunsets but I enjoyed their company and thank them for the memories. I have quite a few photo’s in my album of them. Johnny West and The Sunsets. Re the listings of group members the lead guitarist was Bob Breeze and the bass guitarist was Ian Apps.We appeared at so many venues throughout the midlands including the Ma Reagan hot spots The Ritz,The Plaza , The Brum Cavern at Small Heath and also appeared at The Cavern which was situated off the Dudley Rd i think.I remember the conditions were terrible at this one.It was situated underground and condensation dripped off the walls and ceiling.During our time we supported several well known acts including Joe Brown,Wayne Fontana and The Mindbenders and The Applejacks to name a few.We had so many good groups in and around Brum like Carl Wayne and The Vikings The Astonairs,Gerry Lavene and The Avengers,Mike Sheridon and The Nightriders,Denny Laine and The Diplomats and a group who are never mentioned Karl Fenn and The Mysteries.We could go on for ever loved playing with them and hope they all enjoy meeting each other as much as we do.We cant bring those great days back but we relive every moment at our get togethers.Mal Scott. Regular get togethers have resulted in the Sunsets rehearsing for a possible Reunion gig,watch this space it could happen soon. Johnny West and The Sunsets are now rehearsing together after 50+ years.Studio work is leading to thoughts of recording a cd of 50/60 songs.More info to follow.Mal Scott.